Cochichewick Brook is a small stream that runs from Lake Cochichewick to the Merrimack River. Because the stream had water year round local investors including Dr. Joseph Kittredge, Isaac Osgood, William Sutton, George Hodges, George H Gilbert, and Captain Nathaniel Stevens chose to adapt existing saw mills and grist mills along the brook to produce textiles and textile machinery. These small water powered enterprises established grew into large manufacturing companies which were the economic engine for North Parish from the early 1800s until the 1960s. Isaac Osgood owned a sawmill/gristmill on Cochichewick Brook in the area now called Machine Shop Village. He lived nearby on Osgood Street, across from Edgewood Retirement Center and near today’s North Andover High School. In 1835 he sold his forty-acre mill site and an adjoining seven-acre pasture to 29 year old carpenter George H Gilbert and Andover native blacksmith Parker Richardson, who were partners in the Gilbert & Richardson machine shop in Andover South Parish. They relocated their business and its 30-40 employees to this new location because Cochichewick Brook was a year-round stream which would dependably supply power to their equipment. The first Gilbert & Richardson building in North Parish was a two story wooden building which was 100 feet long and 40 feet wide on top of a brick basement (u on facing map). The firm quickly outgrew the 12,000 square feet of the original building and increased its size twice. The building itself is long gone. However, the second building, the 1860 steam powered Brick Block, exists today known as 21 High Street. This second building with over thirty thousand square feet of space illustrates the tremendous growth in the company’s business during the period 1835-1860 due to the explosive growth in the woolen industry. The labor force of 30-40 workers in 1835 tripled to over 100 in 1860 and 350 during the Civil War. The Andover North Parish 1830 map shows fewer than thirty houses around Isaac Osgood’s sawmill site on Cochichewick Brook. When Gilbert and Richardson relocated their 30-40 employees to the North Parish in 1836, the newcomers put an immediate strain on the local housing market. Some became boarders with local families but rental housing was needed for the first time. The company provided it in the form of dwellings along Elm Street. Most were constructed and some were moved from other locations. When you take the walking tour, note the houses built in the 1830s-1840s. The tripling of the labor force by 1860 led to second wave of building of worker housing. In 1866 Davis & Furber owned 43 residential buildings. Trolley service from Lawrence to North Andover began in 1868. After that, mills ceased building employee housing. The Gilbert & Richardson partnership was reformed several times with a shifting group of partners (See picture in the lobby) due to the national Financial Panic of 1837, bankruptcy, need for additional capital for expansion, and illness. Sounds similar to stories on today’s business pages. The 1851 partnership name, Davis & Furber, was retained thereafter because it was a successful brand, in modern parlance, although Charles Furber died of typhoid at age 39 in 1857. After the Civil War the Davis and Furber Machine Company continued to expand. Over 900 employees were on the payroll in 1882. The following year Davis & Furber Machine Company converted from a partnership to a privately held corporation with 67 year old George L Davis as Treasurer and Managing Director. He continued in this role until his death in 1891 when he was succeeded by his 47-year-old son George Gilbert Davis, sometimes known as ‘the second Mr. Davis’ to distinguish him from his father. By the time of his death in 1920, Davis & Furber sold to customers worldwide a complete line of machines and supplies to fully equip a woolen textile mill. George G Davis chose his second cousin Samuel F Rockwell to succeed him as Treasurer and Managing Director. Sam Rockwell’s leadership encompassed the challenges of the Depression of the 1930s, the boom of the World War II demand for textiles, and the beginning in the 1950s of the decline of the woolen textile industry in New England (a local sign of that decline was the closure of the Sutton Mills in 1962). Throughout that over forty year period he adhered to the conservative principles laid down by Mr. Davis, including the requirement that all company directors live in North Andover. He lived within walking distance of the company, as had the Davis men before him. His retirement in 1964 at the age of 86 was the end of an era in which top management lived and participated in the same community as their employees. His successor presided over a period of rapid decline in the American textile industry, which moved south and then offshore. As a result of the recession of 1970-1, many New England mills ceased production, including two North Andover plants (the original 1813 Stevens mill and the Osgood Mill) in 1972. When Davis & Furber closed down its operation in 1981 it was the last of the four great textile enterprises in North Andover to die, and the last supplier of carding equipment in the United States. A year after the company had passed into history, the neighborhood was named to the National Register of Historic Places. In 1983 the Davis & Furber Campus was sold by the Davis Family and converted into an office complex for large high-technology companies. After several boom and bust cycles in the office real estate market, the mill buildings were renovated again in 2007-2010 into a mixed-use complex that achieved federal historic preservation accreditation and reflected the values of a new generation of environmentally-conscious planning and shared living and working space. The campus remains one of North Andover’s major employers, containing 36 companies and 21 apartments in the space once occupied by Davis & Furber. Six generations of the extended Davis family worked at the privately owned business that became Davis & Furber. The first generation was 29 year old carpenter George H Gilbert who went into partnership with 32 year old blacksmith Parker Richardson in 1835. In the same year they rented the company-owned boarding house to Parker Richardson’s widowed sister, Mrs. Roberts, and they hired George Gilbert’s nephew, 19-year-old George Lucien Davis (2nd generation), who moved from his home in Brooklyn, Connecticut, to Andover North Parish to learn the machinist’s trade. Being single, he lived at the boarding house. When George L Davis became a partner at age 25, he married his landlady’s daughter Harriett Roberts. The picture below, taken in 1886 outside their house on Elm Street, shows George (70) and Harriet (65) Davis surrounded by their offspring. The Grandparents both lived several more years and outlived 9 of their children and 2 of their grandchildren. In the front, to the right of patriarch George L Davis, are his 42 year old son George Gilbert Davis (3rd generation) with his 32 year old wife Ada Whitney Davis. George G, an 1865 graduate of Harvard, worked for his father-in-law’s banking firm for several years. According to his biography, “Mr. Davis connection with it … might have continued except for his father’s wish to have his son associated with him. In consequence of this wish, Mr. Davis renewed his business association with his father.” George L and Ada lived to be 76 and 66 respectively, dying within months of each other in 1920. In the picture the 4th generation include 5-year-old Charles W. Davis (in front of his parents, Ada and George) and his 8 year old sister Madeleine (in leftmost chair). Their sister Dorothy was born in 1890 after this picture. Madeleine and Dorothy lived long healthy lives as significant shareholders in Davis & Furber but uninvolved in its management. Sadly, Charles W Davis, died at age 16 in December 1897. When Charles died, his father was left without a male heir to take over the business. George G Davis’s first cousin Mary Gilbert Davis Rockwell had six healthy sons, shown here, who were also 4th generation. 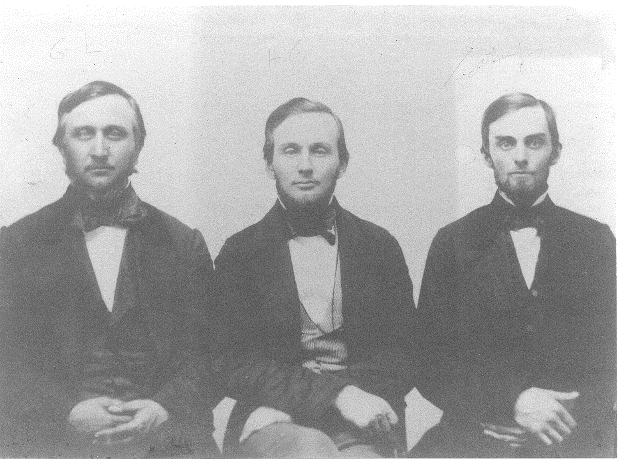 Second from left is Henry Davis Rockwell (1876); third from left is Samuel Forbes Rockwell (1878). George G Davis hired them both in 1898. Sam Rockwell, a 1900 graduate of Harvard College, became Treasurer and Managing Director upon Mr. Davis’s death in 1920. Many long-time North Andover residents will remember Sam Rockwell and will recognize him in the picture on the left.His son S Forbes Rockwell, Jr. (5th generation) will also be remembered by many. His son Sam F Rockwell, III (6th generation) worked briefly for the firm in the early 1960s. Family management ended with the eldest Sam Rockwell’s retirement in 1964. The story of the Furber family is brief. The firm was a a shifting set of partnerships until 1851 when the name Davis & Furber was adopted. This name was to remain until the firm was closed in 1982. Mr Furber's participation ended with his death at thirty-nine in 1857 of typhoid fever, leaving behind a widow and a very young son. "Died in North Andover, June 18, 1857, of typhoid fever, Charles Furber, Esq.,Representative to the General Court from this town, aged thirty-nine. On the announcement of his death, the entire village of his residence was shrouded in sadness; business was at once suspended; a flag was hung at half-mast and mourners were seen in the streets. Funeral obsequies were observed on Sabbath afternoon; first at the dwelling house, where prayer was offered by Rev. Mr. Brayton of Lawrence, and members of his choir sung pieces both Impressive and appropriate. The remains of the deceased were then followed by a long procession to the Unitarian Church in North Andover. Select portions of Scripture were read by Rev. Mr. Vinal, pastor of the church, who also offered fervent prayers remembering with affecting interest the widow, child, and all who suffered by the sad bereavement."